Can knowledge, spirituality and action change the World? Organized by the Al Jazeera Center for Studies, the Interdisciplinary University of Paris (IUP) and the Science & Islam project. This exceptionnal meeting brought together 27 personalities, among whom 2 Nobel Prize recipients and researchers from the universities of Berkeley, Oxford, Cambridge and the Sorbonne. To popularize and present to the public certain philosophical implications of contemporary science. To show how a pluridisciplany approach to humanity and its understanding of the world, bringing together both exact sciences and social sciences, can be the basis of a new form of dialogue among cultures. To explore ways and identify princples around which an intelligent and reasoned exchange can take place among science, religion, and cultures. To construct a process for delineating the role of science in the search of meaning in a more and more complex globalized world, a world full of promise but one which also carries dangers and threats for future generations. In the U.S. and Europe, scholarly dialogue between scientists and theologians can be uneasy and difficult at times. In the Muslim world, it is largely non-existent, for fear of offending religious traditionalists. An important step toward remedying this situation was taken recently in Doha, Qatar, at a conference titled “Science, Cultures, and the Future of Humanity.” The gathering, held from May 30 to June 1, was jointly organized by the Al Jazeera Center for Studies (the think tank of the Arabic television network Al Jazeera) and the Interdisciplinary University of Paris (IUP), whose Science and Religion in Islam program is a major grantee of the Templeton Foundation. For Dr. Jean Staune, founder and general secretary of the IUP, the gathering in Doha was a unique opportunity “to create dialogue and debate between Muslim experts in science and religion and their Western counterparts.” No less important, he told the Templeton Report, was the chance it presented “to make known the research of Muslim scholars in the Muslim world.” The conference was entirely funded by Al Jazeera, which also gave the event extensive coverage. All fifteen hours of the conference were broadcast live on Al Jazeera Mubashir, a public affairs channel, and three hours of interviews with conference participants were broadcast on the main Al Jazeera channel, with an average audience of more than 60 million viewers. To the surprise of everyone present, the opening session of the conference was attended by Yusuf al-Qaradawi, the host of a weekly program on Al Jazeera and one of the most influential theologians in the Islamic world. After the session ended, al-Qaradawi congratulated Guessoum on his remarks. The conference also won wide coverage and positive notices in the Arab press and on Arabic websites. 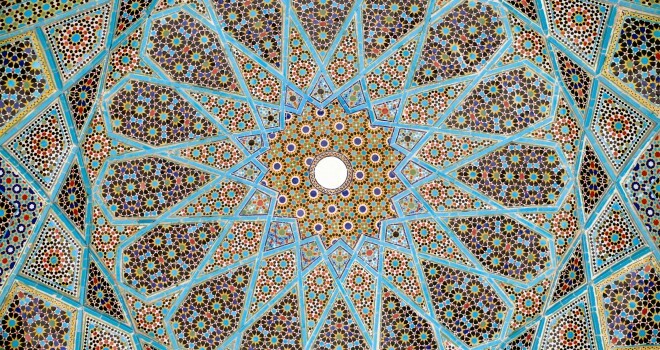 Of special interest to Muslim commentators were the views of Nidhal Guessoum; Dr. Bruno Abd-al-Haqq Guiderdoni, an astrophysicist who directs the Observatory of Lyon; and Eric Geoffroy, an Arab philologist and specialist on Sufism at the University Marc Bloch in Strasbourg. 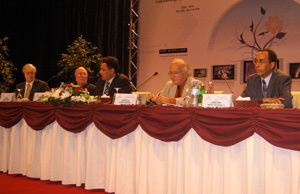 Other participants in the conference included Charles Townes of the University of California-Berkeley, winner of the 1964 Nobel Prize in Physics (and of the 2005 Templeton Prize); Denis Alexander, director of the Faraday Institute for Science and Religion at Cambridge University; Philip Clayton, professor of religion and philosophy at Claremont Graduate University; Keith Ward, the former Regius Professor of Divinity at Oxford University and a Fellow of the British Academy; Ehsan Masood, a London-based journalist and contributor to Prospect, Nature, and New Scientist; the Iranian philosopher and theoretical physicist Mehdi Golshani; and the epistemologist and biologist Mustapha El Mourabit, director of the Al Jazeera Center for Studies. One of the most discussed sessions of the conference was a presentation by Denis Alexander on the relationship between theology and the theory of evolution, an increasingly sensitive subject in the Muslim world. “Although evolution itself cannot be used to support any particular ideological position,” he said, “believers since the time of Darwin have realized that the theory can be accommodated quite easily within a theistic worldview.” Darwin’s ideas, Alexander suggested, are “entirely consistent with a Creator God who has intentions and purposes for the world that He has brought into being.” The speech was translated into Arabic and posted on the Al Jazeera website. Another session outlined the many scientific objections to creationism and intelligent design as alternatives to evolutionary theory. ← Is the internet making us dumber or smarter?